No-one likes to think that their property is at risk of theft or damage, but sooner or later you have to face it. Items of value can be targeted. A local pool shop was facing this very issue. Any retail establishment will have a range of products and plant that might be attractive to thieves, and they were no exception. They decided to take action. A metal roller door already protected the property and was doing a pretty good job, but there were weaknesses. The shop owner knew that properties in the area had been ram-raided, too. They decided to take action to minimise the risk and contacted SHUG for help. SHUG identified two areas of improvement. To protect the property from ram-raiders, SHUG recommended installing two removable bollards along the front of the roller door. These super-strong bollards will deter ram-raiders, and stop them from being successful if they try. 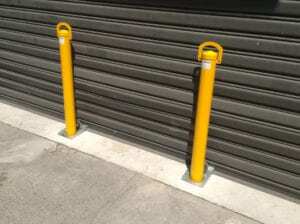 Removable Bollards offer protection and access. Ideal for shop fronts and similar situations. 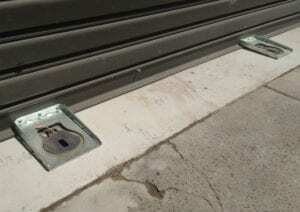 Because of the proximity of the bollards to the roller door, an additional security measure was also possible. SHUG added custom brackets to the base of the door so that the bollards would lock the door down. 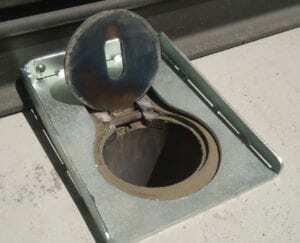 As a result, thieves cannot prise open the door. Thanks to another neat and tidy installation, the pool shop owner is delighted with their new bollards! You and your property can benefit from a similar installation, so contact SHUG today for expert advice. SHUG has a range bollards, and bespoke solutions are available.